Balloon flights in Broome County depart from Otsiningo Park right on the beautiful Chenango River in the city of Binghamton. The park is easily accessible and offers plenty of parking for you and your group. Bring the family to enjoy a truly breathtaking experience as you float away effortlessly in your own hot air balloon. Come fly in the morning and enjoy the beauty of a sunrise from the air almost as if it were planned just for you and your group. Fly in the evening and watch a scenic sunset only New York could provide. When we land our experienced chase crew will pick us up and bring us back to our original launch site where we will celebrate our flight with a champagne toast at the end. 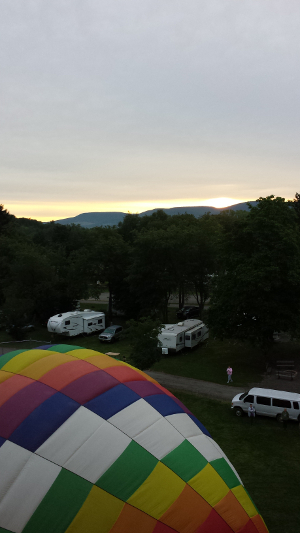 Experience the beauty of the Southerly Hills of Broome County from the air with Southern Tier Balloon Tours. Or if it is more convenient for you, we can use our new launch site at St Mary's!